Click here to see all of our special sets and projects! 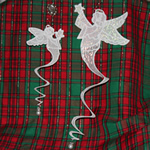 Click here to see our Mini Mylar Sets! 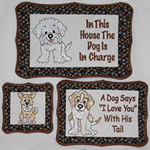 Have you seen ads for “Mylar” embroidery designs? 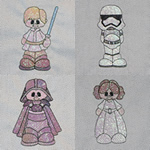 They are becoming quite popular because it is a technique that can be done on any size embroidery machine, it is not expensive, and it adds “sparkle” to the design. If you haven’t tried it yet, this article may answer some questions for you. Mylar is actually the trademarked name for a particular brand of polyester film from DuPont. It has been adapted for a variety of uses. Like some other words in the English language, the trademarked name has come to mean something a little more generic. It now refers to several types of plastic - including the kind used to wrap food - and in cellophane gift wrapping. Cellophane or mylar gift wrap is not paper, but a coated polymer film such as polypropylene. Why use it in embroidery? 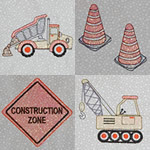 If an embroidery design has been digitized for use with mylar, the addition of mylar will make the design sparkle almost as if it has been sewn with metallic thread (but without any of the headaches!). Each digitizer can make mylar designs the way they want to. At Charming Station we try to make it easy for you. In most of our designs, the first color in your design will be an outline of an area where the mylar will go. After you sew the first color, you will lay a piece of mylar on top of your hoop, making sure that it covers the outline completely. You can hold this in place with small pieces of tape if you like. The second color will tack the mylar down for you. 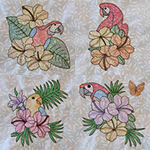 This process is exactly the same as an applique except that you use mylar instead of fabric. Having these extra steps means that you will be sure to cover the area that needs mylar and you won't have to waste extra mylar covering areas that don't need it (or cutting it so large that it fits the hoop). For Charming Station designs, I recommend that you wait until all of the colors have finished sewing out before you trim the excess mylar from the designs. This way there is no risk of tearing the underlying layer of mylar in the design. To remove the excess, just tear it gently back from the sewing line. If there are tiny remnants left, you can remove those with tweezers. Click here to download complete instructions for our mylar designs. Will the background fabric show through? Yes, unless you use something to block the fabric. We have a free mylar snowman in our Yahoo group files (see the sign-up buttons below) and the instructions include the steps to create a simple "color blocker" so that your snowman turns out white. You are most welcome to download this free design and try it out. You can also use a product called "Hide It" to block the background color from bleeding through the design. This can be purchased from a number of stores and online vendors. We have recently tested a new product, White Mylar, that makes it possible to use prints and colored backgrounds without a lot of extra work. We have samples of our sew-outs here for you to see the difference. We highly recommend the White Mylar for use with printed fabrics! How do I know if a design is made for mylar? Most digitizers will include the word "mylar" in the title or the description of the item. We also recommend that you look for photographs of the finished design rather than just the output from software which does NOT show you a true picture of what your design will look like. Software pictures are computer simulations. Photos of the sewn out design are much more realistic and show you that the digitizer has actually tested the designs. Can I use mylar with any design? No, most designs are too dense. Density in embroidery means how close together the rows of thread sew out. In most designs, you want the rows to be close enough together so that the fabric underneath doesn’t show through. 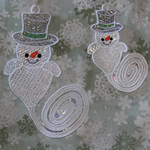 In order to see the “sparkle” in a mylar design however, the rows in the design have to be a little farther apart. That allows light to reflect off of the mylar behind the stitches which is what causes the sparkle. Can I just use any FSL design with mylar? Maybe. Free standing lace (FSL) is usually made with several layers of thread building enough structure to hold the design and the shape without any fabric as a base. This may mean that the layers provide too much density for the mylar to show through. Regular FSL may also have spaces that are too big to hold the mylar in place without tearing which means that the design will not last the way it should. If your design has even stitching fairly close together across the whole surface of the design, it will probably work well and add lovely sparkle to your sew-out. You can experiment and see how it looks. 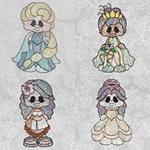 Can I use any applique design and replace the fabric with mylar? Probably not. 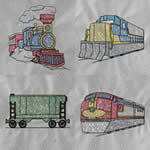 Most applique designs have large open areas where fabric used as the applique takes the place of embroidery stitches. These large open areas do not have additional stitching over the applique fabric; they just use a satin stitch to hold the fabric in place. 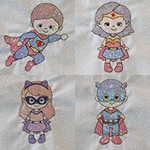 Mylar does not need a thick satin stitch to hold it in place (it may be a design element, but it isn't required). 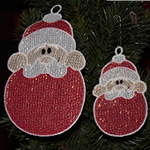 In addition, if there is a large open space, the mylar could tear and come off, ruining the sparkly look of the design. Mylar designs rely on slightly open but fairly consistent stitching across the surface of the design to hold everything in place. What does it look like without the mylar? Because the rows of stitching are farther apart, your background fabric will show through much more than a regular design. Please click here to see large pictures and a complete explanation of what happens if you don't use mylar with a design that is optimized for mylar. How long does it take a mylar design to sew out? This is one of the most fun parts of this new technique. Because the rows of stitches are farther apart, there are fewer stitches in each design. 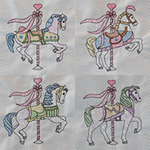 That means mylar designs use less thread and sew out much more quickly than a traditional filled design. The free snowman fits the full 4x4 hoop yet sews out in about 10 minutes. Where can I get this mylar? This is the most tricky question. 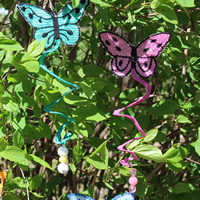 If you are using the design on a craft item that will not be washed and dried in a dryer (or ironed! ), you may be satisfied with the kind of gift wrap that you can get at a dollar store. This kind will not stand up to heat like from the dryer or from an iron. There is, however, a type of mylar that is washable and can be dried in the dryer (on low settings). You can buy in packs of 5, 10, 20, 50, 100 or 200 sheets or try out sample packs of various colors and sizes. Either of these ladies would be happy to answer any questions you might have! Sharon ships to other countries (including Australia). What "color" mylar should I buy? We used "Opal Iridescent" on almost all of our sample sew-outs. This is actually almost transparent and it simply reflects back the color of the thread that is used. That means you can use one piece under an entire design and see all of your colors (as long as your background fabric is white). If your background fabric is not white, we recommend that you purchase White Mylar so that the background colors or prints don't show through your embroidery. 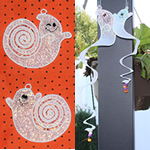 To see an example of a use for a colored mylar, look at the picture for the Autumn Fancy set or the Mylar Christmas Ornaments set. We used a bright metallic mylar in some of these designs. 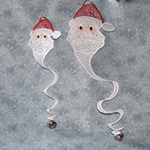 Where can I see a demo of mylar designs? 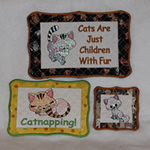 We are located on the east coast of the US and love to vend at large quilting and sewing expos. We demonstrate mylar designs all day at these shows. You can view our travel schedule here.